As a teenager and into my early twenties I was a vegetarian. I have always loved vegetables and beans, but I have appreciated meat more as I've gotten older. When I was growing up I was never a big fan of meat and would eat all my vegetables and side dishes, leaving the meat completely untouched. Finally when I was a teenager my mother agreed to let me give meat up entirely and become a vegetarian. As a vegetarian I ate a ton of veggie burgers. Bean burgers, rice burgers, tempa burgers, you name it I loved them all. In my middle twenties I started eating meat again and then met my meat loving husband. I'm pretty sure that he thinks that bacon is a separate food group. My two boys are somewhere in the middle. While they love bacon and meat in general they are also huge veggie fans. This week I tried a new recipe for White Bean Burgers with Spinach from the July issue of Better Home and Gardens Magazine. This recipe has 10 ingredients. It takes 8 minutes of cooking time and 25 minutes of prep and makes 4 servings. I did make a few changes to this recipe. First I left off the parsley. My two boys won't really eat parsley in anything, so I rarely use it. I have no idea where the recipe was finding 19oz cans of beans. All the beans I have ever found at the grocery store have been 15.5oz. So I used one 15.5oz can and it worked perfectly. I was unable to find country Italian bread, so I used French bread instead. I toasted it as the recipe suggested. Don't make my mistake and use a small pan. Using a small pan made it hard to flip the burgers, I would suggest using a large pan making the flipping and cooking easier. I followed the remainder of the recipe as written. These veggie burgers were very popular in my house. My two boys at first were skeptical, but after tasting them they ate their whole servings. I like that they are served open faced, it makes the burgers easy to eat and makes for a beautiful plate. This would be a great recipe for a meatless Monday meal or any day of the week. 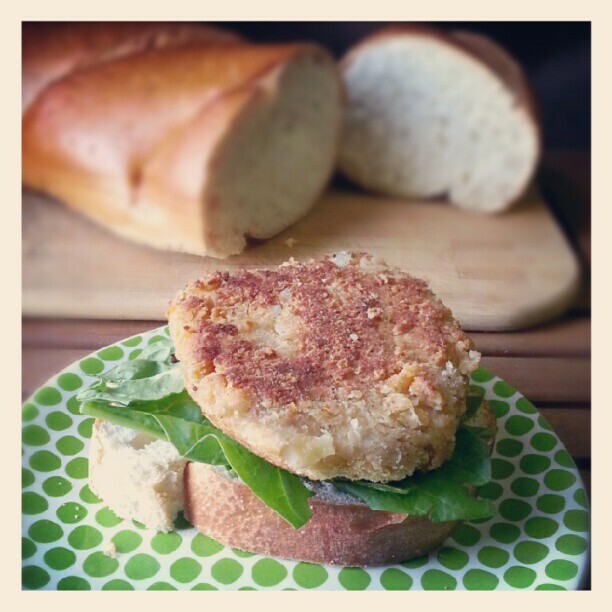 For the recipe go to White Bean Burgers with Spinach. Thanks they really are easy and yummy :) Thanks for the follow, I already follow you. Come back again soon! I agree with Sandra this looks really good. I might even be able to get my fussy husband to try it. I'm hopping on in from the Exposure 99% Hop and will definitely be back to look for even more recipes to test out. These sound amazing!! My husband is a meat-lover all the way but maybe I can get him to try (and like) these. Thanks for the idea! Found you via the Aloha Friday Blog Hop! My husband is a big meat person also :) Thanks for the visit, going over to check out your blog now! White bean burgers? YUM! Thanks for sharing at Meatless Monday hop! They really are yummy, I hope you like the recipe! Oh yummy! That looks so delicious! Thanks :) They are a nice veggie burger option, not dry and full of great flavor!